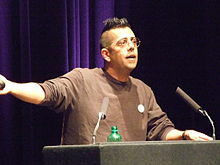 Simon Lehna Singh (born 1 January 1964) is an Indian-British author of Punjabi background with a doctorate in physics from Emmanuel College, Cambridge, who has specialised in writing about mathematical and scientific topics in an accessible manner. Nine Million Bicycles, alternative lyrics. Romantics might like to think of themselves as being composed of stardust. Cynics might prefer to think of themselves as nuclear waste. What seems certain is that Pythagoras developed the idea of mathematical logic... He realized that numbers exist independently of the tangible world and therefore their study was untainted by inaccuracies of perception. This meant he could discover truths which were independent of opinion of prejudice and which were more absolute then any previous knowledge. This page was last edited on 28 December 2017, at 00:49.